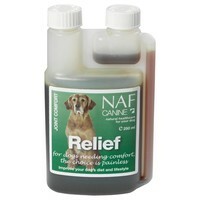 NAF Canine Relief is a power herbal liquid for dogs that has been formulated specifically to provide joint comfort. Containing Devil’s Claw, which has been proven to have anti-inflammatory properties, NAF Canine Relief has been made with a number of herbs known for their natural calming properties, and combined with a high concentration of naturally sourced antioxidants. NAF Canine Relief is the ideal choice for older dogs and those prone to impaired movement, and stiff joints.